The California gunman who shot and killed his ex-wife and four others before turning the weapon on himself had filed for divorce last year because he believed she had cheated on him. Officials say there are indications of a domestic violence motive in Wednesday's rampage, but investigators don't know what specifically set Javier Casarez off. In his petition for divorce filed in December, Casarez accused Petra Maribel Bolanos De Casarez of cheating and asked the judge for his wife's text messages to specific phone numbers. The judge denied the request. Kern County Sheriff Donny Youngblood says Thursday that detectives are looking into whether Bolanos may have had relationships with two of the victims, Manuel Contreras or Antonio Valadez. Bolanos had recently filed for an unspecified change in orders involving child support and property. Authorities say the gun used in a Bakersfield, California shooting rampage was owned by the suspect. Kern County Sheriff Donny Youngblood says Thursday that Javier Casarez legally purchased the five-shot .50-caliber handgun in 2004. The 54-year-old turned the weapon on himself after killing five people, including his ex-wife, on Wednesday. Youngblood says Casarez had been arrested for vehicle theft in the 1980s. The sheriff says Casarez did not have a history of violent crime. Officials say there are indications of a domestic violence motive, but investigators don't know what specifically set Casarez off. His ex-wife had recently filed for an unspecified change in orders involving child support and property. Authorities have identified the gunman and all five victims of a shooting rampage in Bakersfield, California. Kern County Sheriff Donny Youngblood says 54-year-old Javier Casarez used a .50-caliber handgun in the shootings Wednesday evening. Youngblood has also clarified that one of the victims was Casarez's former wife, 45-year-old Petra Maribel Bolanos De Casarez. Court documents show their divorce was finalized in April. They had three children. Casarez shot 50-year-old Manuel Contreras and Casarez's ex-wife at a trucking company, then pursued 50-year-old Antonio Valadez from that scene and killed him. Casarez then went to a residence and killed 31-year-old Laura Garcia and her father, 57-year-old Eliseo. Casarez shot himself to death when confronted by a deputy. Authorities say a man who killed five people, including his estranged wife, in Bakersfield, California, targeted victims at two locations during a half-hour rampage. Kern County Sheriff Donny Youngblood says Thursday that the gunman and wife were in divorce proceedings but the motive in shooting the others Wednesday evening remains under investigation. The sheriff says the gunman likely forced his wife to go to a trucking company where he shot a man, his wife and then pursued another man who fled and finally killed him. The gunman then went to his home, where he shot another man and that man's daughter. Youngblood says the daughter may have tried to intervene. The gunman then carjacked a vehicle and drove to a friend's business where a deputy confronted him. The deputy's body camera video shows the deputy repeatedly ordered the man to drop his weapon before the man shot himself. Authorities say a man who killed five people, including his wife, in Bakersfield, California, was in the midst of divorce proceedings. The gunman used a five-shot .50-caliber handgun that had to be reloaded during about half-hour of violence at several locations Wednesday evening. Kern County Sheriff Donny Youngblood said Thursday that gunman's the estranged wife had recently filed for an unspecified change in orders involving child support and property. Youngblood says it's not known if that was the catalyst for the violence. But he says it carries the implications of domestic violence. The sheriff says authorities are investigating how the other victims were involved. The shooting started at a trucking company where the gunman shot a man and then his wife. The gunman then went to a home where he shot a man and daughter. He then carjacked a vehicle, let a woman and child get out and drove off. The gunman shot himself in the stomach when he was confronted by a deputy. A friend of a man killed in a Southern California shooting rampage says he was a good family man and doesn't know why he was targeted. KERO-TV, citing information from family members, reported Eliseo Garcia and his daughter, 32-year-old Laura Garcia, were two of the five victims of the Wednesday evening shootings in Bakersfield. David Bunting lives two doors from the Garcia home. Bunting said Thursday that Laura Garcia was a mother of four and her father was a self-employed truck driver who always was with his grandkids when not working. He says most of the large family were home when the Garcias were shot and are devastated and in shock. Police say the unidentified gunman killed his wife and two other men at a trucking business, then went to the Garcia home. The gunman killed himself as a deputy approached. Authorities believe the motivation was a domestic dispute. Domestic violence is being investigated as a motive in a rampage by a man who fatally shot five people, including his wife, before killing himself in Bakersfield, California. Kern County sheriff's Lt. Mark King says Thursday there are "strong indications" of a domestic violence motive in the Wednesday evening rampage. But he says that was still being verified and did not release further details. King says positive identifications of the dead will come from the coroner's office. King says he expects more information to be released later in the day. 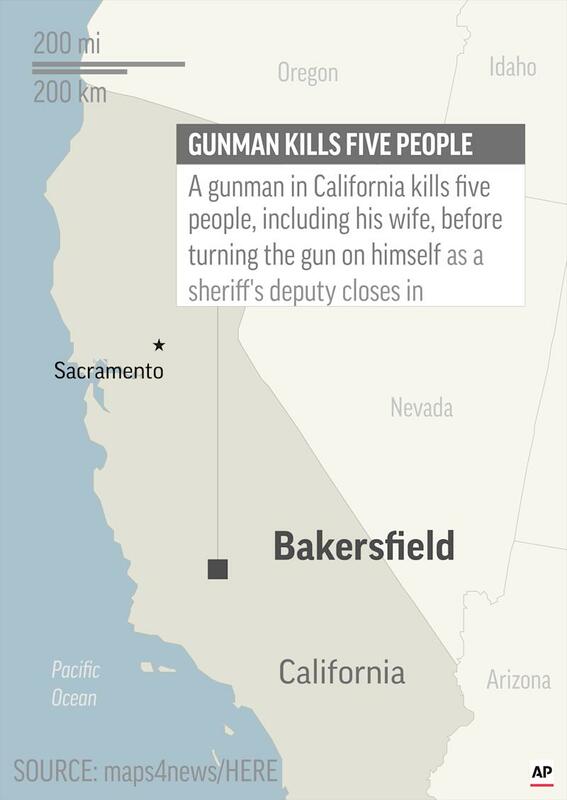 Authorities say a gunman killed five people, including his wife, before turning the gun on himself as a Kern County sheriff's deputy closed in Wednesday. Authorities say a gunman in California has killed five people, including his wife, before turning the gun on himself as a sheriff's deputy closed in. There's no immediate word on how the other victims were related.